This entry was posted on October 5, 2018 by Herb. Maywood, IL – The new 900 Tracer GT is a sport-touring bike that riders will never want to stop riding. So it makes sense to give those riders a VStream Windscreen that makes the ride more enjoyable. 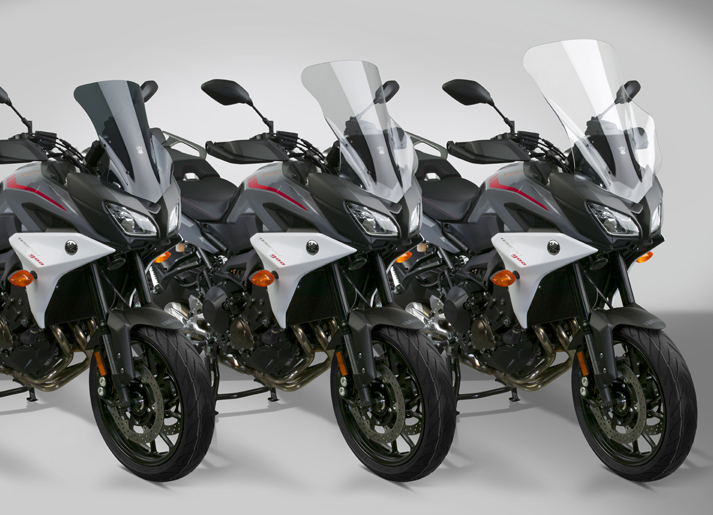 Three different sizes and tints ensure a perfect windscreen for almost every rider size or riding preference. All will offer improved wind protection and riding comfort compared to OEM or other aftermarket windscreens. VStream gets its name from its unique patented shape. The advanced “V” profile and dimensional contours push the wind vortex out and away from the rider's helmet, resulting in a peaceful, quieter riding environment. These windscreens are made from tough 4.5mm Quantum® hardcoated polycarbonate. This high quality material, along with state-of-the-art manufacturing techniques, provides outstanding clarity, impact strength and scratch resistance unmatched by any windscreen maker worldwide. Quantum hardcoated polycarbonate is the material of choice for serious motorcycle riders. It is 10X more abrasion resistant than FMR hardcoated polycarbonate, and 30X more than windscreens made from commonly used acrylic or "aircraft plastic”. VStream Windscreens are easy to install and are protected by a 3-Year Warranty against breakage! Download high resolution photography of VStream Windscreens for the Yamaha 900 Tracer GT.